God can use godless people to accomplish his purposes. Jeremiah predicted that Babylon, not Egypt would be God’s instrument of judgment on Philistia. The “waters rising in the north” (2) refer to Babylon. Babylon was the “sword of the Lord.” (6) It is hard for people to accept a godless nation, like the Babylonians serve as God’s instrument of judgement. But it is true. Babylon would have to face judgement one day for their sins. They were not getting away with anything. Their own kingdom would fall to the Persians in about seventy years from the time of the exile. God can use godless people to accomplish his purposes, for he is the Owner of all the world. We cannot put God in a box, saying that God can only work this way and in no other way. God can work how he wants. He is God. He is fulfilling his purposes. And in this chapter, he chooses to work through the godless nation, the Babylonians. I need to not put God in a box and insist that he must only work in a certain way. I want to be open to follow God and hang on tight as he leads me in ways that I could never imagine. How is God going to send career missionaries to remote communities in northern Canada? How will God build up the body of Christ among us here in Dekalb/Sycamore? He is working and will continue to work in very imaginative and “out of the box” ways. Sometimes we don’t want to know why we are suffering, because like Moabites, we may be called to repentance. God’s goal is humbly us and draw us closer to him. That is not easy to accept. Could the present world events with Muslim extremists or with Russia and China be a message for America? What could happen to America if we let pride and arrogance grow unchecked? It is something to think about. It is a definitely a call to search out hearts and our souls. There are a lot of verses here to digest. I tried to highlight some verses to distill it down and see what God is trying to say to Moab here in this passage. 26 Let Moab wallow in her vomit;…. 33 Joy and gladness are gone from the orchards and fields of Moab…. (45) the skulls of the noisy boasters. It seems that Moab was very boastful. They thought they were a nation of valiant warriors. She thought that she was powerful. They were enjoying life with joy and gladness coming from their orchards. Verses 29-30 reveal what was making him so upset about Moab. “We have heard of Moab’s pride— how great is her arrogance! —of her insolence, her pride, her conceit and the haughtiness of her heart. 30 I know her insolence but it is futile,” declares the Lord, “and her boasts accomplish nothing.” Moab had a bad history with God’s people. They had frequently harassed Israel. They had tried to curse the Israelites in the wilderness (Nu 22-25). It was their time to be judged for their sins. Chemosh was the god of Moab (7,13). He would go into exile with the Moabites who worshiped him. The cities of Moab from one end to the other (Heshbon to Zoan) would be destroyed (9), because Moab had defied the Lord (42). God encouraged Babylon to sweep into Moab with its armies. They were not to be lax in doing the Lord’s work–the work of punishing Moab (10). God’s hand of judgment has a redemptive purpose. His people, the people of Judah would be refined and return to the Lord with humble obedient hearts. Even Moab could be restored. Look at verse 45 says, “Yet I will restore the fortunes of Moab in days to come,” declares the Lord. Here ends the judgment on Moab.” God leaves people with hope, even though they would be receiving some very harsh treatment. If we want to exalt ourselves and think more about ourselves than we ought, we must repent pray that God may transform our hearts into humble hearts. God’s divine discipline is going to happen. We should not wait for God to do it for us through some very difficult discipline. 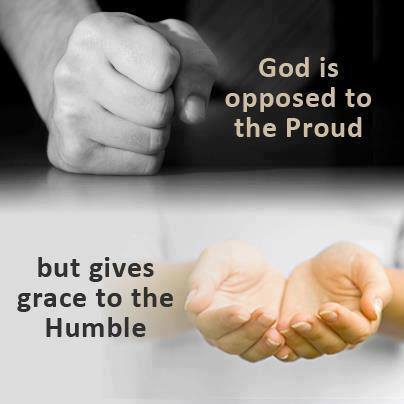 One Word: Pride and arrogance invite God’s discipline.